The new national Scientology Mexico Ideal Organization was dedicated July 10, 2010. 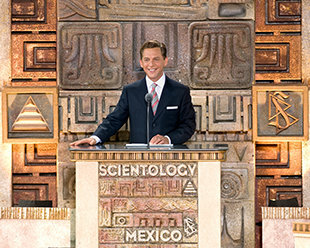 Officiating was Mr. David Miscavige, Chairman of the Board of Religious Technology Center and ecclesiastical leader of the Scientology religion, with civic leaders, government officials and 7,000 Scientologists and their guests in attendance. A thirty-man mariachi orchestra and colorful traditional dancers opened the dedication ceremonies for the new national Scientology Organization for Mexico. Attended by 7,000 Scientologists, guests and civic leaders, the occasion commemorated the grand opening of Latin America’s first Ideal Organization of Scientology. Mr. Miscavige cut the ribbon on the new Ideal Organization for Mexico, joined by special guests and local Scientologists who spearheaded the drive to build the new Ideal Organization. Mr. Martin Ponce Rubio, Director of Social Programs in the Department of Justice, acknowledged the Scientology Organization’s selfless crusade for drug education and drug rehabilitation, and how the new Ideal Organization for Mexico represents a commitment to a glorious nation free from drug abuse and delinquency. Mr. Miscavige (center right), with guest speakers (left to right) Dr. Jesus Corona Osornio, Doctor of Religious Philosophy and author; The Honorable Ricardo Guzman Wolffer, Federal Court of Appeals Judge and author; Mr. Alejandro Rojas Dias Duran, Secretary of Tourism, City of Mexico; (right of Mr. Miscavige) Ms. Laura Chapa, Senior Advisor for Special Education, Federal Ministry of Education; and Mr. Martin Ponce Rubio, Director of Social Programs, Department of Justice. Following the grand opening ceremony, thousands of visitors streamed into the reception area of the new Scientology Ideal Organization for Mexico. 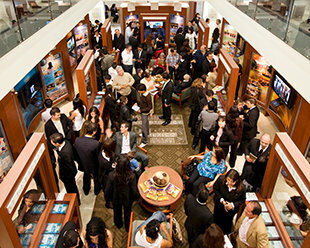 The lobby and reception leads straight into an extensive multimedia Public Information Center describing Dianetics and Scientology beliefs and practices, and the life and legacy of Founder L. Ron Hubbard. In the new Ideal Organization’s Public Information Center, thousands learn about the beliefs and practices of the Scientology religion, the life of Founder L. Ron Hubbard, and the many social betterment and community outreach programs sponsored by Scientology. 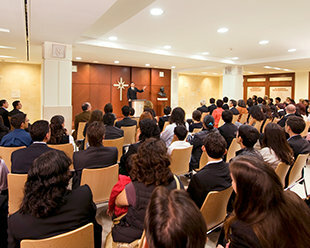 The chapel of the new Scientology Organization for Mexico serves parishioners and guests for Sunday Services, Weddings, Naming Ceremonies and other congregational gatherings. The new national Scientology Ideal Organization for Mexico stands at the cultural center of Mexico City, within walking distance of the National Arts Museum, the National Palace of Government, the National Bank and the National Supreme Court. Its six stories and 55,000 square feet make it the largest Scientology organization in Latin America. The entrance and reception area—in a modern Aztec motif—welcomes those of all religions and cultures, as well as Mexico City’s growing Scientology congregation and their guests. The Ideal Organization’s spacious reception opens into a five-story atrium, inviting parishioners and visitors into the new building. A central wall of native limestone rises fifty-two feet to the sky-lit roof, inscribed with the words of Founder L. Ron Hubbard. All are welcome to take a self-guided tour of the Public Information Center, which presents the answers to questions about Dianetics and Scientology through seventeen state-of-the-art audiovisual displays. The spacious chapel of the new Scientology Mexico Ideal Organization—where parishioners and their guests gather for congregational gatherings, including Sunday Services, Weddings, Naming Ceremonies and other events. The Ideal Organization’s Purification Center, where parishioners engage in a precise and closely supervised religious regimen called the Purification Program, which addresses barriers to spiritual gains. Parishioners gather at the rooftop café for meals and snacks, and to mingle with friends during breaks from course and counseling sessions. Overlooking verdant Alameda Central, the outdoor terrace of the rooftop café offers a stunning view of the cityscape, and is the perfect setting for parishioners and their guests enjoying refreshments before and after events or services. As is tradition in every Scientology Organization in the world, the national Ideal Organization for Mexico holds an office for its Founder, L. Ron Hubbard. A sign of respect and a representation that the Church remains true to his teachings, the office serves as a tribute to Mr. Hubbard’s legacy and his vision for a brighter, saner world. A beacon of hope and prosperity, the new Scientology Ideal Organization for Mexico stands at the heartbeat of the city. Serving the citizens of this vibrant megatropolis, it is dedicated to bringing its effective solutions to bear across every sector of society. Seven thousand Scientologists and their guests gathered on July 10, 2010, to celebrate the grand opening of Latin America’s first Ideal Organization of Scientology, located in the heart of Mexico City. The ecclesiastical leader of the Scientology religion and Chairman of the Board of Religious Technology Center, Mr. David Miscavige, presided at the historic ceremony, welcoming those in attendance to their new National Organization in this City of Palaces. Mr. David Miscavige, ecclesiastical leader of the Scientology religion and Chairman of the Board of Religious Technology Center, presided at the dedication of the new national Ideal Scientology Organization for Mexico. The ceremony marked the conclusion of a full-scale reconstruction and design of Mexico City’s Juarez Building. Directly adjacent to the Fine Arts Palace and neighboring the National Supreme Court, the National Bank and the National Palace, it stands as a six-story contemporary cultural landmark. Now fully reconfigured to accommodate Scientology religious services, the building also includes an extensive Public Information Center with multimedia displays presenting and illustrating Scientology beliefs, the life of its Founder, L. Ron Hubbard, and its many social betterment and outreach programs. “Take this Ideal Organization and use it for all it is intended. “You say there is drug abuse out there? Well, you now have the wherewithal to ignite a ‘drug-free movement’ more potent than anything littered along trafficking lanes. “You say there is criminality and cruelty out there? Well, you now have The Way to Happiness to rebuild self-respect and revivify the goodness within every human being. Also commemorating the occasion and expressing its significance to their country were leaders from diverse fields in this Central American nation. With those words, and joined by local Scientologists who led the drive to build the new National Organization, Mr. Miscavige cut the ribbon, ushering in a new era for cultural change and freedom in Latin America.